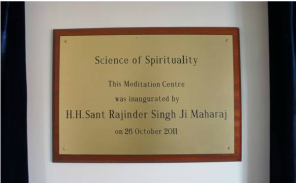 Science of Spirituality is a global, non-profit spiritual organisation under the leadership of Sant Rajinder Singh Ji. We are hundreds of thousands of people of all nationalities, races and faiths deeply committed to a spiritual way of life based on meditation, service to others, and personal transformation. If one were to summarize the mission and goals of Science of Spirituality in a few words, those words would be spirituality, peace, and service. With headquarters in Delhi, India, as well as a main centre in Chicago, USA there are 1,400 centres in forty countries. It offers people all over the world an opportunity to find peace, joy, and spiritual fulfilment. Teachers of Science of Spirituality present a simple and natural method of meditation leading to inner and outer peace. It provides a means whereby people of all ages, religions and nationalities can integrate meditation into their lives. This practice has been referred to as Surat Shabd Yoga, Sant Mat, or meditation on the inner Light and Sound. Practitioners learn how to develop noble human values that will transform and enrich their lives, enabling them to make positive contributions to the world. Practicing the Sant Mat approach to spirituality does not require leaving one's faith, for at the core of each faith, we believe, is the one divine power that is the common goal of all spiritual aspiration. Raising our consciousness to experience God's Light within ourselves is the primary mission of Science of Spirituality. It is this practical experience of oneness-of ourselves with God, and of all beings with each other-that leads to true peace and fulfilment. In Birmingham and surrounding areas, regular gatherings have taken place for the past 40 years. In the early days the gatherings took place in local hired rooms within schools, universities and hotels. In the year 2003, we became a registered charity in the UK. We also held a major tour programme with spiritual talks given by Sant Rajinder Singh Ji. Hundreds of people gathered from across the country and abroad.